In 2018, Expats Paris, launched the first conference, Paris Talks, as a platform for provocative and disruptive ideas about the future of humanity. The conference format is short, powerful, inspiring talks, combined with entertainment and networking opportunities. Conference issues range from fields of technology, art, and design, to science, environment, humanities and more. The main focus of the conference is to pose questions about the future, such as, "What does the future look like?" "Can anyone ever predict what the next century will be like?" 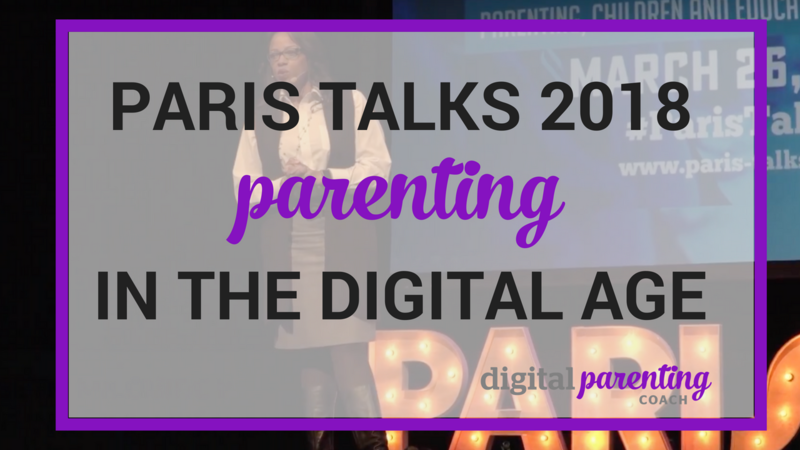 I was invited to be a speaker at the 2018 Paris Talk and I spoke on the subject of Parenting, Children and Education in the Digital Age. Below were the key points for my talk, but as you can see from the video, I went a tad off-script after listening to some of the speakers. I wanted to really engage the audience and drive home my concerns and support for digital parents: communicate with your children and don’t be afraid of Internet, technology and social media. The digital age is fascinating and the technological advances are mind-boggling. Technological advances without always ensuring privacy and wellbeing for children. What is the future for our children in this digital environment? Technology has fantastic opportunities but without parental support and education on the use of technology, children will be harmed. Organizations working to support children for the future: Council of Europe, Apple investor investigation, Center for Human Technology, Common Sense Media and the Truth About Tech. Organizations are all moving forward to ensure that children and young people control technology responsibly and safely, rather than being controlled by technology. The notion of digital citizenship has evolved to encompass a range of competences, attributes and behaviours that harness the benefits and opportunities the online world affords while building resilience to potential harms. So, what do YOU think is the future of parenting in the digital age? You can head over to the Digital Parenting Community on Facebook and join other concerned and supportive parents or you can send me a message at [email protected].